All transactions are safe and secure with a reliable history in online purchasing behind each of our associates. Buy the Rambo Last Blood t-shirt to own Rambo clothing and merchandise. Strap your Rambo bow to your back and head into the jungle wearing one of these Rambo Last Blood tees. The front of the tee displays an undead Rambo with the title "The Last Blood" above him. Wear it to watch Sylvester Stallone eliminate his enemies with the bow and arrows on his back. John J. would be in the zone in this tee, with only his mission on his mind, and of course Co Bao, his attractive Vietnamese girlfriend. Pair it with Rambo 2 t-shirts and browse below for the First Blood Rambo 2 knife. 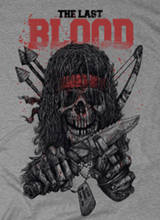 In addition to the Rambo Last Blood tee above, browse the Rambo Clothing Gallery for more apparel like men's and women's clothes, kids shirts or hoodies.